When I signed up for this marathon back in December, I knew that the name itself suggested that this was going to be a “fun” marathon, but it certainly exceeded my expectations. Shoot, they already had won me over at the expo when they decided to give 50% off of all the Asics Flying Pig Apparel during the last hour; the way people reacted you would have thought it was Black Friday! 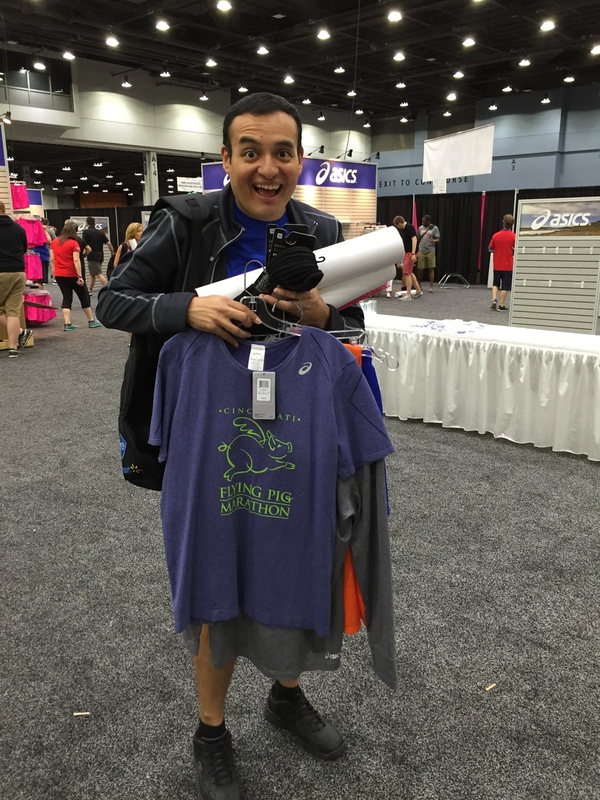 We also received a sling backpack with our race shirt, which made our running swag that much better. Overall, there was just this great vibe from the people, and it translated really well onto the race today. 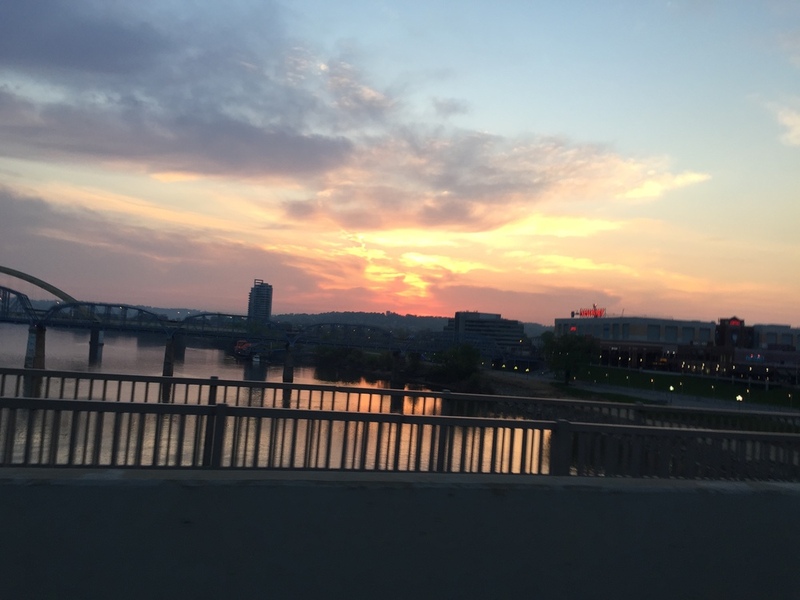 I decided to stay in Covington, Kentucky for two reasons. One, it was close to the start line, across the riverfront, and two, it was considerably cheaper than staying in Cincinnati. 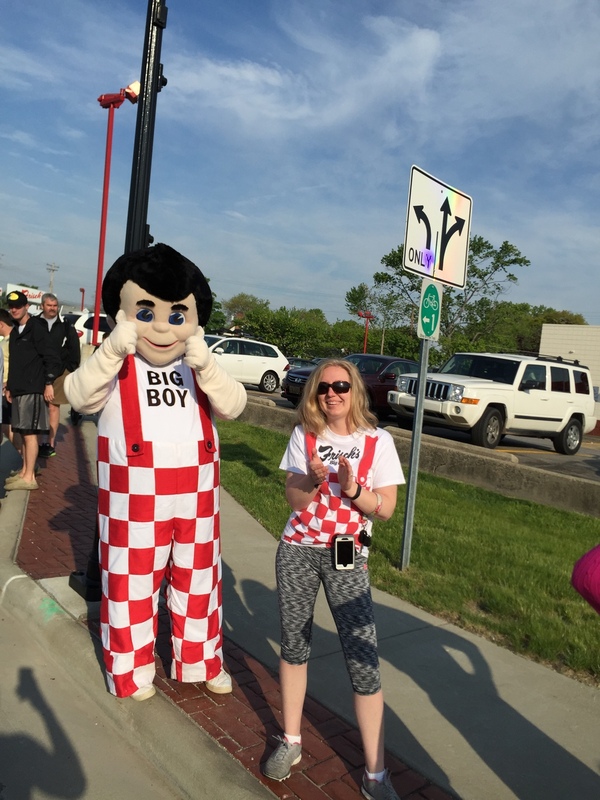 The race was set to start at 6:30 a.m., and the start line was located right by the Paul Brown Stadium, which is home to the Cincinnati Bengals. I left around 5:40 a.m. and made it to a parking garage by the stadium in 10 minutes. I have to admit, the whole process was seamless. Glad I studied the event parking info the night before. Wendy and I checked our drop bags and then took a moment to get some pre-race photos; she was running the half marathon. We made it to our appropriate “Pig Pens” aka corrals just in the nick of time. A quick kiss and good luck to each other, and we were off! Ready to start the race! Something I've learned with running several of these is you have to look at it a mile at a time or else you might get overwhelmed; I did exactly that. I purposely held back a little and maintained a good 8-minute pace for the first 8 miles. I was feeling good with every mile, even with the elevation climb. The support along the course was just outstanding. 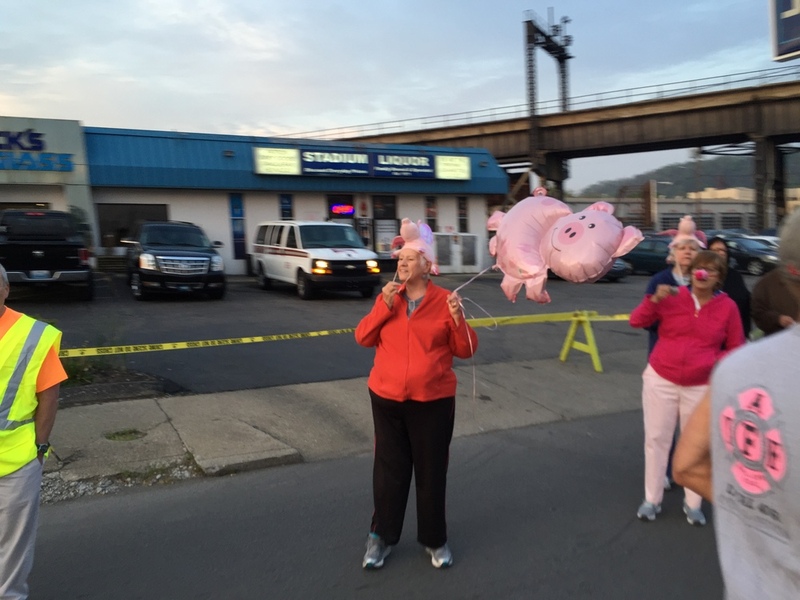 I thought the Fargo Marathon had great community support, but Cincinnati did an awesome job. There seemed to be more aid stations than usual and that was due to community members just coming out to support (and cheer) runners. Something I really enjoyed about running this course was the amount of bridges we ran across and views of the Ohio River. What I did not enjoy was the amount of hills; they were tough! Mile 17 is where a giant hill “broke” me. It didn't break my spirit but my left hamstring just wasn't the same after it. I wasn't the only one. I watched some people stop and walk up that hill. I’m proud of myself, because I didn't stop to walk once during the race, not even during that hill. Afterwards, my left hamstring began to bother me, and I couldn't fully extend my leg; hence, my stride was off. This always worries me, because at times I think that my leg won’t extend, and I’ll go flying to the ground. This kept me to a jogging pace for the next 6 miles. At this point, my pace was less of a concern. I was a little bummed but whatever; this isn't an easy course, and I just wanted to finish. The crowd was very supportive along the way, shouting words of encouragement while holding funny race signs. This kept me going and prevented me from stopping to walk, and believe me, I wanted to stop. Even though I had stopped paying attention to my time since mile 18, at mile 23, I noticed that if I could find the strength to run a little faster, I could get under 3:40. Also, then I heard a group of runners say, and I quote, “This marathon is longer than this other one I did.” I rolled my eyes. WTF?! Haha. I sped up for the last 3 miles. My hamstrings and legs were burning, but my legs were moving to beat the clock. I knew I wasn’t going to PR, but ever since Philly, I feel like I have brought my training to a whole new level. This has made me set a new standard for myself when finishing the marathon. I really feel that maintaining a time of 3:40 or better, with the proper training, is more than within my ability, and I think today proved that. I had some trouble with 6 miles of the race and I was still able to finish it in 3:38:10. I’m excited to keep training hard and improving my times. Next up is the Des Moines Marathon, and I will be focusing on a PR. Between now and then, I will be doing Ragnar Wasatch Back and whatever other races may come along. As always, thank you to everyone who supports me on my crazy running adventures.